B0837. PHILIP L. MILLER. 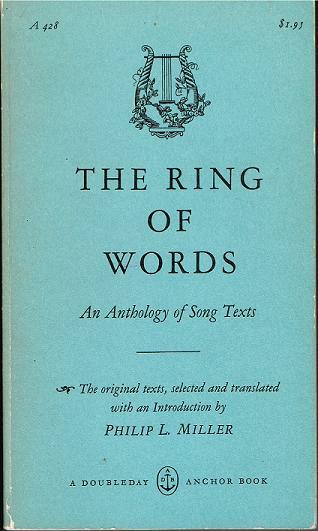 THE RING OF WORDS, AN ANTHOLOGY OF SONG TEXTS. 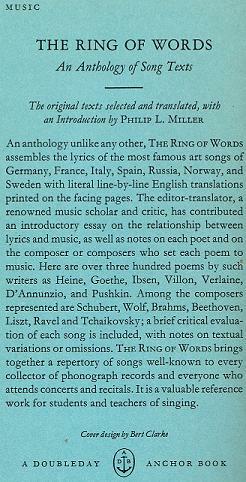 Includes German, French, Italian, Russian, Scandinavian and Spanish Songs; The original texts, selected and translated with an Introduction by Philip L. Miller. Garden City, NY, Anchor Books, 1966. 518pp. Index of Composers; Index of Titles and First Lines. Softbound. “An anthology unlike any other, THE RING OF WORDS assembles lyrics of the most famous art songs of Europe with literal line-by-line English translations printed on the facing pages. The editor-translator, a renowned music scholar and critic, has contributed an introductory essay on the relationship between lyrics and music, as well as notes on each poet and on the composer or composers who set each poem to music. Here are over three hundred poems by such writers as Heine, Goethe, Ibsen, Villon, Verlaine, D'Annunzio, and Pushkin. Among the composers represented are Schubert, Wolf, Brahms, Beethoven, Liszt, Ravel, and Tchaikovsky; a brief critical evaluation of each song is included, with notes on textual variations or omissions. THE RING OF WORDS brings together a repertory of songs well known to every collector of recordings and everyone who attends concerts and recitals. It is a valuable reference work for students and teachers of singing. Philip Lieson Miller, a musicologist and for many years a distinctive presence on the New York cultural scene, retired as chief of the music division of the New York Public Library in 1966, he was nearly as much of an institution as the library itself. He was instrumental in building its collections into one of the world's finest and largest repositories of recordings and music lore, second in this country only to that of the Library of Congress. Under his guidance the archives grew to some 70,000 recordings, ranging from wax cylinders of Metropolitan Opera performances, vintage 1901 to 1903, to the best of the latest LPs. He wrote extensively on music. He was ubiquitous as a commentator, arranger or presenter at library concerts, music exhibitions and countless events with rare recordings or opera stars, in person or on the radio.